(Newser) – In the wake of the Aurora shootings, President Obama yesterday went further into the issue of gun control than he ever has, Politico reports. 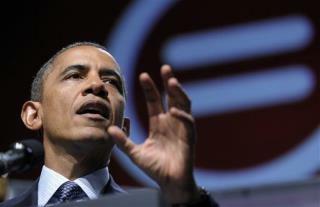 Speaking in New Orleans, Obama promised there would be a national conversation on the issue. Specifically, he declared support for background checks on gun buyers and better enforcement of gun laws, and said that "AK-47s belong in the hands of soldiers," not criminals—which could imply future support for an assault-weapons ban similar to one that expired in 2004, the Washington Post notes. Our embarrassing clown of a president just doesn't know what to say these days. Our princeturd is in panic mode.